Pur~lisse pūr~delicate gentle soymilk cleanser & makeup remover - This brand has been in my Ipsy bags many times, but never a cleanser. This cleanser is sulfate free and formulated with soy milk, whole oat and white tea. It's meant to wipe away makeup as well as cleanse the skin. Dr. Brandt pores no more anti-aging mattifying lotion - This product helps to delay signs of aging. Retinol improves the appearance of fine lines and wrinkles, while apple stem cells work to maintain the longevity and activity of the skin's own stem cells. NYX Lip Butter in Hunk - These lipsticks are awesome. They're moisturizing and mega-pigmented. Hunk is a gorgeous vampy purple pink. 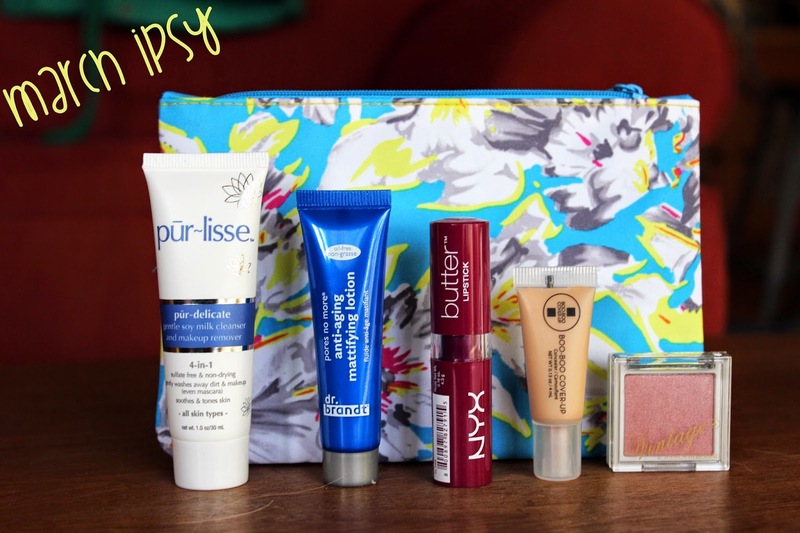 Are you an Ipsy subscriber? What came in your bag this month?